WELCOME TO VIXEN WATCH WHICH INCLUDES NEWS AND ARTICLES ON SWEET BRIAR COLLEGE, LIBERAL ARTS, STEM, STEAM, COLLEGE FINANCE, AND MORE. CAN YOU BELIEVE IT? THANKSGIVING IS NEXT WEEK. PLEASE SCROLL DOWN TO THE ‘THANKSGIVING TRADITIONS AND/OR MEMORIES SUBMITTED BY MEMBER OF THE SWEET BRIAR FAMILY‘ SECTION WHERE YOU CAN READ A FUN AND BEAUTIFUL THANKSGIVING ANECDOTE. WITH SO MUCH PUBLICATIONS FROM SWEET BRIAR COLLEGE- THE NEW AND IMPROVED SWEET BRIAR MAGAZINE, THE BRIAR WIRE, PLENTY OF SWEET BRIAR COLLEGE FACEBOOK PAGES, ETC. – AND A DECLINING NUMBER OF PEOPLE READING VIXEN WATCH, THIS WILL BE THE LAST VIXEN WATCH FOR THE UNFORESEEN FUTURE. AS THE ALUMNAE REPRESENTATIVE FOR FLORIDA I WILL STILL MAKE SURE THAT FLORIDA ALUMNAE RECEIVE IMPORTANT NEWS WHEN NECESSARY. THANK YOU AND HOLA, HOLA. MANY ALUMNAE ARE CURRENTLY BUSY RECRUITING NEW STUDENTS TO STUDY AT SWEET BRIAR COLLEGE. HERE IS A GREAT VIDEO ANY ALUMNA OR FRIEND OF THE COLLEGE CAN USE TO RECRUIT STUDENTS. DON’T SKIP THE ‘SUBMITTED BY MEMBERS OF THE SWEET BRIAR FAMILY‘ SECTION AS YOU MAY FIND QUITE A FEW INTERESTING CONTRIBUTIONS. DON’T FORGET TO CHECK THE ‘EVENTS‘ SECTION FOR CLUB MEETING, ALUMNAE ART EXHIBITS AND MUCH MORE. MARK YOUR CALENDAR AND START SAVING! REUNION IS GOING TO BE JUNE 2 THROUGH 4 2017. IF YOU HAVE AN EVENT YOU WOULD LIKE ME TO POST PLEASE SEND YOUR DETAILED REQUEST TO THE COMMENT BOX. DON’T FORGET TO ADD LINKS, FLYER, AND/OR PHOTOS. THANK YOU. ou are in the Board Room! The Sweet Briar College BOD held its fall meeting this Thursday through Saturday. Tremendously exciting things are being done to ensure the renaissance of our beloved College! A couple of interesting facts from the Alumnae Engagement side: Alumnae have donated 99,000 hours with a total value of $12 M. Ninety-eight alumnae and friends returned to campus this summer to participate in “Sweet Work Weeks,” helping to ready the campus for the return of our students. Sweet Briar alumnae lead the way among all women’s colleges in participation on the Alumnifire platform that supports career opportunities. Right now, there is a ratio of 15 alumnae standing ready for each student, to help with jobs, internships, mentoring, etc. Two hundred and sixty AAR’s (Alumnae Admissions Reps) covered 150 college fairs this fall. Please plan on returning to campus this summer (June 2-4, 2018) for Reunion. All classes are encouraged to come home! Finally, I have been so happy to see how busy and happy our students are…the campus is alive with activity! Prof. Melanie Stine and several Sweet Briar Environmental Sciencestudents attended a symposium hosted by the World Wildlife Fund in D.C. on Tuesday. The focus was the resiliency of natural systems and communities in response to climate change, with topics ranging from wetlands in Australia and mangrove forests on the coasts of India and Bangladesh to forest fires in the U.S. West. The group also met with two biology alumnae, ate lunch at food trucks and walked to the White House. DO YOU SHOP ON AMAZON? DID YOU KNOW A PORTION OF YOUR PURCHASE COULD GO TOWARD SBC? SIGN UP FOR AMAZONSMILE AND SELECT “SWEET BRIAR COLLEGE” AS YOUR CHARITY! DID YOU KNOW YOU CAN MAKE A MONTHLY GIFT TO SWEET BRIAR? THE COLLEGE CAN SET UP A RECURRING CREDIT CARD PAYMENT FOR YOU OR YOU CAN EVEN SET IT UP THROUGH YOUR BANK. CALL 1-800-381-6131 TO GET THE PROCESS STARTED! TO MAKE A GIFT NOW, VISITSBC.EDU/GIFT. When I was a Peace Corps Volunteer in Tunisia a bunch of us Americans, like 20 of us, would get together, with one year at my house in Kasserine to celebrate. We would have to special order a turkey as lamb and mutton were more the local dishes…. We had to chase our turkey around the courtyard to prepare it for the oven….depluming and all…..made fabulous almond/couscous stuffing and then carried it down to the local bread baker who had the only oven in town big enough for a turkey….walking back and forth for basting, and it was a success! Everyone pitched in to make the trimmings and the next day we had the best turkey soup of my life made by the well digger volunteers. Proof that leftovers are always the best part of a Thanksgiving dinner worldwide! Is there are silver bullet for 14-16 recruitment? Please join the Richmond Sweet Briar Alumnae Club for Sweet Briar Day Afternoon Tea at The Jefferson Hotel on January 8, 2017. The event will begin at 2pm and end by 4:30pm. President Stone will be our guest speaker. By submitting the form below, you are reserving your spot for the event. The cost is $40 which includes the event, taxes and gratuity.RSVPs will be taken until December 28, 2016. Payment is due by December 30, 2016. The club must submit full payment to the Jefferson by January 1, 2017. PLEASE CHECK THE NEW INFORMATION IN THE ‘ALUMNAE ALLIANCE SECTION‘ ON THE ATHLETICS AND RIDING HALL OF FAME INDUCTION. NOMINATIONS MUST BE SUBMITTED BY NOVEMBER 18. BY NOW YOU SHOULD HAVE RECEIVED AN EMAIL IN THE MAIL REQUESTING TO PARTICIPATE IN A SURVEY REGARDING SWEET BRIAR. AS YOU MAY KNOW THESE SURVEYS HELP SWEET BRIAR COLLEGE DETERMINE HOW TO PLAN FOR THE FUTURE. PLEASE DON’T IGNORE THIS EMAIL AND TAKE THE SURVEY BY NOVEMBER 16 THE VERY LATEST. YOUR PARTICIPATION IS VERY IMPORTANT TO THE COLLEGE AND VERY MUCH APPRECIATED. THANK YOU!!! ONCE AGAIN A SWEET BRIAR VIXEN NEEDS YOUR HELP TO FUND A SUMMER MEDICAL INTERNSHIP IN AFRICA. PLEASE CHECK THE “VIXENS HELPING VIXENS” SECTION AT THE BOTTOM. PLEASE DON’T FORGET TO ALSO CHECK THE “EVENTS” SECTION AT THE BOTTOM. SWEET BRIAR COLLEGE sponsors Steeplechase Pony Races! Alumnae from Columbus, Albany, Macon and Atlanta come in to staff the prospective student table. What a day!! She co-produced the movie ‘All In time’ which can be bought at iTunes. Your SBC Board dining at the riding center after a long day of committee meetings! We’ll be hard at work through lunch on Saturday. Wish you could be here to enjoy the beautiful campus, and see how happy and active our students are! — at Sweet Briar College Riding Center. Students in the JYS in Seville – Sweet Briar College program have been exploring their temporary home city since they arrived in Seville in September. Here they stand opposite El Hospital de la Caridad with a statue of the founder Miguel de Mañara, who is carrying a sick man to the hospital for care. The hospital, shaded by palm trees and filled with baroque art, has not changed much since its founding in 1674. The statue captures the spirit of Seville, a southern Spanish city where a close community embraces service to others. In fact, most of our students (studying abroad from Northwestern University) are volunteering or interning at schools and organizations that do good. In addition to their coursework, students are building character and CVs by working with organizations that help people who are disabled, suffering from Alzheimer’s or part of the LGBT community. There is good stuff in there, like in the old days, our old days. Think about it for holiday shopping. We are overjoyed to announce that there will be an Athletics and Riding Hall of Fame induction in April 2017. The Sweet Briar College Athletics and Riding Hall of Fame honors special achievements by alumnae who have been associated with athletics at the College. These individuals have helped bring recognition, honor, distinction and excellence to Sweet Briar College and the intercollegiate athletics program. If you would like to nominate and alumna for this recognition, kindly complete the nomination form found on the Sweet Briar Athletics website by November 18, 2016. We are always accepting nominations for this important honor. If you have questions, contact Megan Behrle ’09, cross country coach and lacrosse recruiting assistant, at mbehrle@sbc.edu. DID YOU KNOW YOU CAN MAKE A MONTHLY GIFT TO SWEET BRIAR?THE COLLEGE CAN SET UP A RECURRING CREDIT CARD PAYMENT FOR YOU OR YOU CAN EVEN SET IT UP THROUGH YOUR BANK. CALL 1-800-381-6131 TO GET THE PROCESS STARTED! YOU ARE INVITED TO SHARE YOUR MEMORIES OR TRADITIONS OF THANKSGIVING WITH VIXEN WATCH. PLEASE LEAVE YOUR COMMENT EITHER WITH VIXEN WATCH OR ON FACEBOOK. THANK YOU. I notice that I have the Briar Wire available online, and I get a copy in the post. If we request recipients to opt out of the post mailing we will save a tree, some postage, and the smiling faces that prepare them. So, if you already receive the Briar Wire in your emails consider opting out of receiving a hard copy as well. Please contact Clélie Steckel at cdsteckel@sbc.edu if you would like to opt out of a hard copy in the mail. 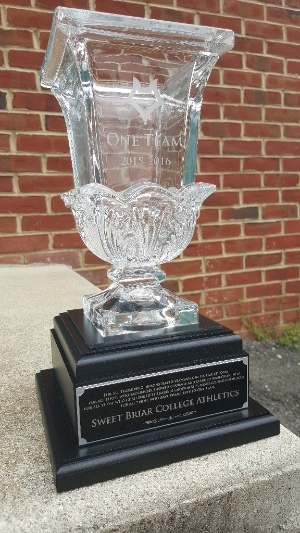 Congratulations to Sweet Briar College’s cross country team for completing its first season. Great job, ladies! Workers’ Wednesday: Jan Osinga (in 1976) the farm manager at Sweet Briar for many years. He also raised the cows and supervised the production of the much beloved Sweet Briar yogurt. During the Thanksgiving break in 1980 – or perhaps it was ’81 – a few students, including myself, decided to stay on campus. For most of us Thanksgiving break was just too short to pay for a trip home. The first two nights we were accommodated in the hostel, the place where male students who came to visit were supposed to sleep. It was one big room with plenty of beds and as I recall we had a lot of fun. After two nights we were divided into different houses for the rest of the vacation. I was placed along with Eman, Terry, Eman’s brother, and a few more students Lai (? ), Vernice (?) in Dean Barlow’s house. I was also in charge of taking care of the Barlow’s German Shephard Zeda (? ), which I remember fondly. Since we were from different backgrounds and each of us had a family recipe to share, we decided to opt out of the traditional turkey dinner and have a potluck instead. Terry was vegetarian – in fact the first vegetarian I had ever met – and Eman and her brother were from the Middle East. So we decided to have a roast leg of lamb (for the carnivores among us) which I prepared from a family recipe, Terry prepared a vegetarian dish, and Eman and her brother cooked up an array of Middle Eastern side dishes. We had a feast on Thanksgiving that I will never forget. The lamb which had been marinated days before was succulent and Terry’s vegetarian dish – which I recall included peanuts – was totally delicious and all the side dishes and dessert that the others had prepared were simply heaven. Today I often serve roasted leg of lamb for Thanksgiving, mostly, though, because nobody in my family enjoys turkey. Is Design Thinking the new liberal arts? Nonprofit Spotlight – Sierra Nevada Journey – How do we meet the STEM workforce demand? Why would Washington STEM give $110,000 grant to Apple? Why are some STEM fields more gender balanced? STEM under the microscope – Where are the girls? What can you do to promote diversity and STEM careers? Is technology still a man’s world? Gender equity – Where do we stand? Why are women who put their careers first just as unlikely to get jobs in STEM? In Summer 2015, Sweet Briar’s alumnae did something that had never happened in higher education. Five thousand women saved a college from closure. From the time closure was announced on March 3 until Virginia’s attorney general issued a legal settlement, Sweet Briar College appeared in the media thousands of times. The communications office was unprepared for the onslaught and for the intense scrutiny that followed. This discussion will center on the communications imperatives born of the experience and how the college is working to regain its footing and reframe the story. See below for more details and for a link to RSVP. We look forward to seeing you there! 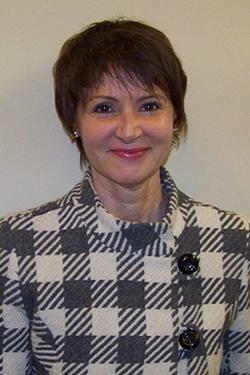 Joelle Ziemian started at Sweet Briar College in February 2016, with nearly 30 years of strategic communications experience in the corporate, nonprofit, international development and government sectors. She worked with colleges and universities in the Washington, DC, office of Lipman Hearne, a national communications firm serving the institutional nonprofit arena. While at Lipman Hearne, she also led a U.S. State Department communications project for Iraq’s Ministry of Electricity and for Mongolia’s Ministry of Energy and Fuel. She worked with two government ministries in Qatar. She started her career as a TV reporter before moving to state and federal government. She served as press secretary in the Pennsylvania Senate and in the U.S. House of Representatives. She moved to the U.S. Department of Energy and then to the private sector where she managed public affairs campaigns for an array of energy clients, primarily in the utility industry. She later did similar work at Edelman and Burson-Marsteller for the Edison Electric Institute, ComEd, Detroit Edison, and Accenture’s global natural resources portfolio. As a consultant in Romania for a U.S. Agency for International Development project, Joelle helped nongovernmental organizations get their message out to key audiences and impact policy. Before Sweet Briar, her most recent communications role was as a Director at Burson-Marsteller, where she was U.S. Client Leader for Royal Dutch Shell. Joelle holds a B.A. from Goucher College and an M.F.A. in Writing from the Vermont College of Fine Arts. Time: 12 – 1:30 p.m.
Visit http://lynchburg.iabc.com/ to pay ahead with PayPal. Reminder: PayPal does not act as an RSVP. Please also RSVP. Lovely ladies!! My beautiful adopted vixen this year is trying to raise money to support a summer internship to Africa to help further her dreams of becoming a surgeon! She has created a go fund me page in an attempt to raise the funds necessary to make this happen!! Let’s show her some love and help make her dreams come true!!! A NEW EDITION OF THE BRIAR WIRE IS OUT. IT INCLUDES AN ANNOUNCEMENT OF OUR FUNDRAISING EFFORTS AND ITS FOCUS FOR THE FISCAL YEAR, AN UPDATE FROM SWEET BRIAR COLLEGE ALUMNAE ALLIANCE AND HOW THE RECIPIENTS OF THE OUTSTANDING ALUMNA AWARD WERE ANNOUNCED. CLICK ON THE LINK TO ACCESS THE BRIAR WIRE. YOU CAN FIND A FEW VERY INTERESTING LINKS AND ARTICLES ON SWEET BRIAR ALUMNAE IN THE ‘SUBMITTED BY MEMBERS OF THE SWEET BRIAR COMMUNITY‘ SECTION. I am very excited to announce this! AND there is also an E-book that you can get for FREE called “Living in Everyday Grace” (These tips are short and to the point because we know you have a full and busy life. Use them often to enhance your personal life experience.) Co-Written by me and other authors of “The Gifts of Grace & Gratitude”. Thanks for all the support and encouragement! We met incredible people and are delighted to help spread the word of UNDER THE TURBAN!! UNDER THE TURBAN – Description: A young, modern Sikh family travels the globe meeting with diverse communities of Sikhs to explore their roots and identity in Sikhism, the world’s fifth largest religion. ‘What makes me a Sikh?’ This question posed by nine-year-old Zara Garcha starts a family’s journey to learn about their religion. The Garcha family explores Sikhism, by visiting diverse Sikh communities around the world. Visiting with maharaja’s, cheesemakers, fashionistas, farmers and scholars to glean a better understanding of the world’s fifth largest religion. Their journey begins in Parma where they meet Sikhs who have a hand in creating Italy’s iconic Parmesan cheese. From there the Garcha family heads east traveling to The Golden Temple in Sikhism’s holy city, Amritsar, learning about the historical foundations and social history of the religion. Lived experience blends with academic insight as the family travels to the United Kingdom, Argentina, Canada and America gaining a better understanding of these modern Sikh communities and the fundamental aspects of this often misunderstood religion. UNAFF (United Nations Association Film Festival), which was originally conceived to celebrate the 50th anniversary of the signing of the Universal Declaration of Human Rights. It was founded by Stanford educator and film critic Jasmina Bojic with the participation of the Stanford Film Society and the UNA Midpeninsula Chapter, a community-based nonprofit organization. Sweet Briar graduate Verda Colvin ’87 Superior Court judge in the Macon Judicial Circuit, has been named to Georgia’s law enforcement task force. Congratulations! Critical need at Sweet Briar! We need your help! The tennis courts at Sweet Briar were last resurfaced 12 years ago, but best practices among collegiate facilities call for resurfacing every 7 to 9 years. Maintenance was limited to patching any problem spots, but patching is not proper maintenance for the long term. As a result, water has penetrated many of the courts as far below the surface as 12 inches. This has caused foundational cracks, surface cracks, dead spots, and separation between the topcoat and the foundational layers of the courts. The courts now have to be rebuilt. Rebuilding the tennis courts is a critical need for Sweet Briar not only for ODAC intercollegiate play but for rebuilding auxiliary revenue through camps and clinics in the off-season. Sweet Briar hosted a condensed version of Dennis van Der Meer’s adult tennis camp this summer; however, any expansion of the camps is in jeopardy due to the condition of the courts. The total sum needed for this project is $275,000. We have already received a $50,000 challenge gift from an anonymous donor to complete the rebuilding of the courts, and other donors have provided an additional $9,000 to date. Former tennis teammates are reaching out to each other to raise the remaining $216,000, but gifts are welcome from all of our Sweet Briar alumnae and friends. Work on the courts must begin before the winter months so that competitions and camps can resume in the spring; therefore, we must reach our goal by October 1, 2016. If the courts are not rebuilt in time for the spring season, our tennis team will have to hold its home matches at one of Amherst’s public schools. If you have questions about this project or would like to make a gift of $10,000 or more, please contact Mary Pope M. Hutson ’83 at 434-381-6131. Click on the link for photos of the tennis courts in the latest Briar Wire. When the College launched a campaign to resurface its tennis courts this summer, Sweet Briar graduate Amoret Thissell Jorgensen ’82 jumped into action. 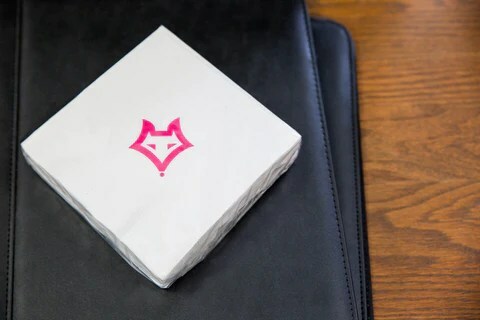 Sparked by an idea from Cindy Conroy ’74, she had already teamed up with Jane Sullivan ’78 to fund the perfect item: paper cocktail napkins bearing the Vixen logo, designed years ago by late athletics director Jennifer Crispen. A package of 50 napkins sells for $20 each, and all proceeds will benefit the tennis courts. Jorgensen and Sullivan’s order of 720 napkin packages could raise $14,400 towards the $275,000 price tag — wow! Debra Elkins ’93 and Sarah von Rosenberg ’72 Co-chairs of the Alumnae Alliance Council awarded with 2016 Outstanding Alumna Award. Congratulations! TO MAKE A GIFT NOW, VISIT SBC.EDU/GIFT. What is the importance of liberal arts in the digital age? How is the gender pay gap the result of life ‘choice’? As tech gender gap widens, what can be done to reverse it? Tech women, tech girls ambassador week begins November 14. Attracting international students – How Australian higher education stays ahead of competition? Why is students’ debt so high for New Hampshire College Grads? RICHMOND, VA ALUMNAE, PLEASE REMEMBER THE LUNCHEON TOMORROW, OCTOBER 20TH, AT WILLOW OAKS COUNTRY CLUB. YOU CAN FIND ALL THE INFORMATION IN THE “EVENTS” SECTION AT THE BOTTOM. ALERT! Sweet Briar College has an immediate need for Alumnae Admissions Representatives (AARs) for college fairs in Connecticut, South Carolina, Rhode Island, Kentucky, Michigan and West Palm Beach, FL. If you are an AAR, please log on the Admissions Advocate to register for these events. If you are not yet an AAR, please sign up at the link below, and we’ll give you the tools to recruit! Thank you! AND NEEDS VOLUNTEERS. CLICK ON THE LINK BELOW FOR MORE INFO. PLEASE CHECK THE ‘VIXENS HELPING VIXENS’ SECTION. A MEMBER OF THE SWEET BRIAR SWIM TEAM IS UNABLE TO ATTEND THE WINTER TRAINING WEEK IN SOUTH FLORIDA DUE TO INSUFFICIENT FUNDS AND COULD USE OUR HELP. HELP WITH THE RESURFACING OF THE TENNIS COURTS, WHICH INCLUDES A COOL FUNDRAISER, IN THE ‘ALUMNAE ALLIANCE’ SECTION. IF YOU HAVE TROUBLE WITH THIS LINK, TRY SBC.EDU AND CLICK ON ‘GIVE ONLINE’ ON THE TOP RIGHT. Choose #8 for designation and type “Tennis Court Resurfacing”; further down on the page select ‘In Memory Of’ and write Vernon L. Kauffman. IF YOU HAVE AN EVENT YOU WOULD LIKE ME TO POST PLEASE SEND YOUR REQUEST TO THE COMMENT BOX. THANK YOU. How can women break the glass ceiling in digital media? Girl powered – What’s behind a new injection of funds for girls and robotics? Buying access to admissions officers? What’s the key to inclusion on campus? For Duke women – higher education, lower self-esteem? Women studies – Has need ever been more apparent? What makes a college president? Please Join RVA SBC Alumnae Club as we welcome Dr Lynn Rainville, Reserach Professor and Director of the Tusculum Institute, to Richmond to hear her speak on “Sweet Briar Founders: What’s Past is Prologue.” Registration begins at 11:30am. The program will last from 12-1pm. We will be selling Dr Rainville’s book, “Sweet Briar College” for $25! You’ll be able to pick it up and get it autographed at the lunch. Reserve your copy today! *If you are unable to attend the lunch but would still like an autograph, please let us know and we will get an autographed copy to you. A MEMBER OF THE SWEET BRIAR SWIM TEAM IS UNABLE TO ATTEND THE WINTER TRAINING WEEK IN SOUTH FLORIDA DUE TO INSUFFICIENT FUNDS. IF YOU WOULD LIKE TO HELP OUT AND DONATE A FEW BUCKS, TOGETHER WE COULD RAISE ENOUGH TO SEND HER TO FLORIDA. IF YOU HAVE TROUBLE SIGNING IN, TRY SBC.EDU AND CLICK ON ‘GIVE ONLINE’ ON THE TOP RIGHT. WHEN MAKING A DONATION PLEASE CHOOSE DESIGNATION #8 ‘OTHER’ AND ADD ‘SWIM TEAM – WINTER TRAINING – CAPTAIN’S FUND’ IN THE SPACE BELOW. SWEET BRIAR COLLEGE IS HIRING! STEM education and its importance, is discussed with ‘James Earl Jones on front page profile’ for public television. How can colleges diversify their student body? Why don’t women win the Nobel prize? What to do about America’s STEM education gap? What to do about America’s STEM gap? I HOPE YOU SURVIVED THE WRATH OF THIS MONSTER HURRICANE, AND TO THOSE WHO ARE STILL NOT IN THE CLEAR, PLEASE STAY SAFE! How are the liberal arts important to STEM? What will it take to have more women Nobel Prize winners in science? Is pop culture the central element to student recruitment? Oman – Need to create space for women in higher political and professional positions in Oman?